I had been pleased with Volkswagen’s MIB II base stereo. It’s no powerhouse, but it has cool features and adequate sound output. To add deeper bass, I would have been satisfied with simply tapping into the rear speaker wires to feed an amplifier and a subwoofer. 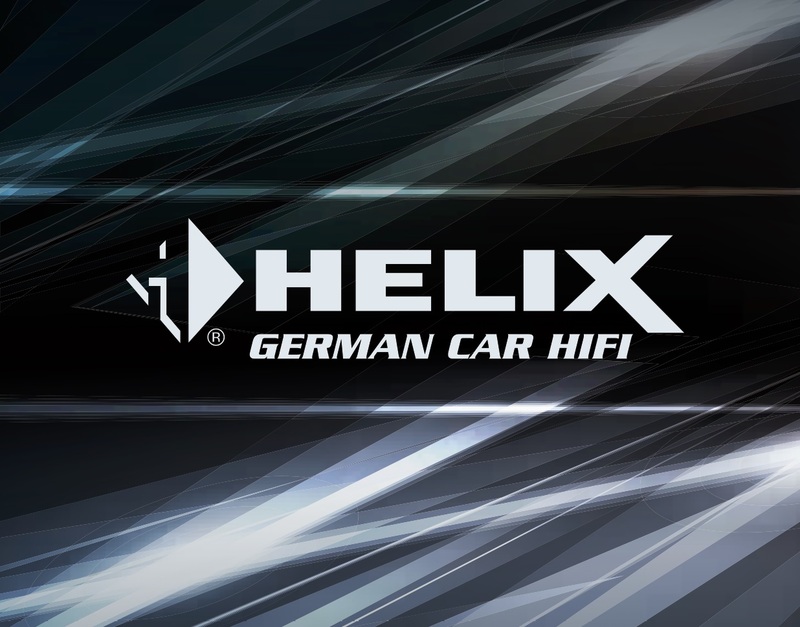 But Volkswagen decided to discontinue an older version of its Helix subwoofer accessory, VW P/N: 000-051-419, meaning they slashed its price by over 50% to quietly clear their inventory. What was once an “is it really worth $660?” item was suddenly a very affordable $300. I managed to get the kit shipped to my door for $235 after some discount shopping and a manufacturer’s rebate. The wiring harness and digital signal processor alone are worth more than that! Watch this video for a introduction to Helix, then return to read my installation tips below. 1) Kill the power! He said it; he illustrated why it is prudent. The instructions say to disconnect the battery for a reason. Just do it. It took just a few seconds to disconnect my battery’s negative terminal. I did not lose any settings. Also, open the hatchback before you disconnect the battery; the hatchback requires power to open. 2) I used these keys to remove the stereo chassis. He said not to shove them in until they click because they sometimes get stuck and can break. I could not pull my radio out without the keys slipping out. So I shoved them in a little farther… they clicked. “DOH!” Clicked into place, they held the radio and enabled me to slide it straight out. But the keys were indeed locked-in and stuck. No worries! With the radio in-hand, all I had to do was press inward on the retaining tabs (depicted by the arrow in this photo) and the key immediately released without need to fight with or risk breaking anything. This may be exactly how they’re supposed to work! 3) I used this pin removal tool from IDParts. The tool pair is a little more expensive than other tools, but they’re robust and reach deeper into bulky connectors. The larger tool worked perfectly for this job! IDParts’ web page has a link to a video that shows how to use the tool. Here’s a photo of it in my hand. 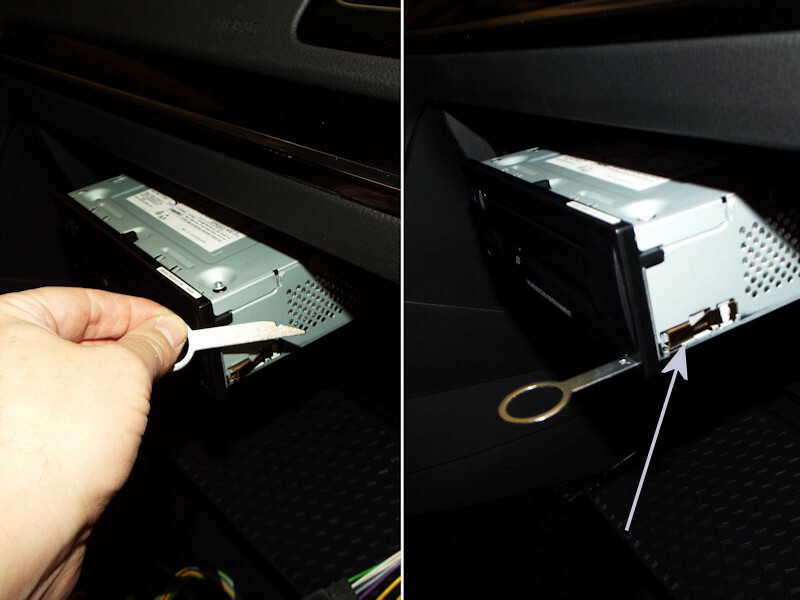 I had slid the stereo unit out of the glove box and gently hung it by the cables that were still connected. I had to swap out one of the wiring blocks and re-pin two of the wires. It was straightforward with the video assisting me, but definitely not “plug-n-play,” as suggested by some of the vendors who sell the Helix upgrade. 4) There’s a tiny potentiometer near the end of the amp (red arrow). Some swear they got better sound after adjusting it. My advice is to leave it alone unless something is already wrong. I met someone whose sub stopped working after he adjusted it. We adjusted the pot and found a sweet spot. Also, the “screw head” is tiny, made of plastic, and very fragile. Again, LEAVE IT ALONE! 5) I did the electrical connections at the front of the car and then did a test of the stereo before committing to routing the cable under the trim panels to the trunk. I could hear the difference right away… much brighter. Of course, it sounded even better once I routed the cable and closed the doors. 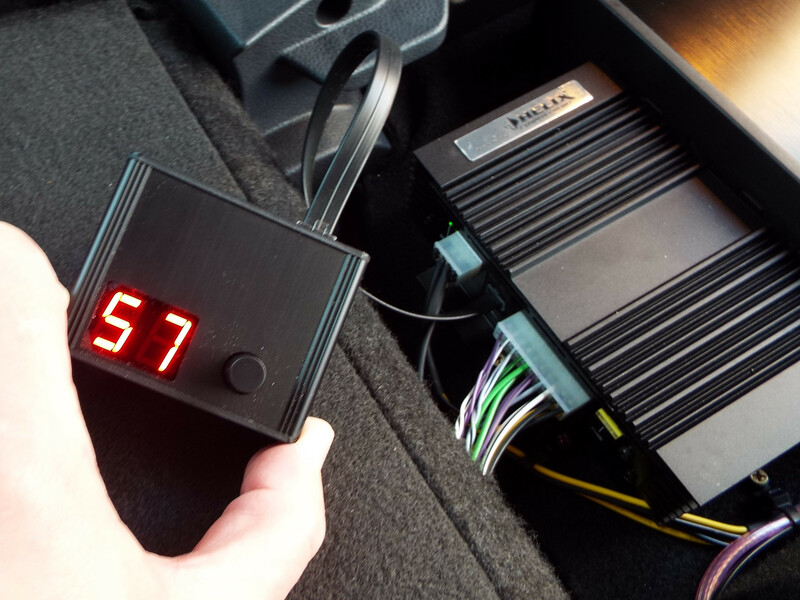 The Helix five-channel amp removes lower bass from the doors and dedicates it to the subwoofer, allowing me to increase the bass setting without over-driving the door speakers. The subwoofer sounds surprisingly good, especially when considering that it has only 6-inch drivers. It sounds like a “larger” system. 6) It very tempting to make sure all parts in the package are used. This includes a small jumper that fits in only one place. “There, all done,” one might think. Not so fast! This jumper is for use on right-hand drive (RHD) cars to force the DSP into accounting for the driver being on the “wrong side” of the car. 😉 It is not used in cars where the driver sits on the left side. Feel free to misplace this part if the system will never serve in a RHD car. I have no idea where mine went. 7) Disconnecting the battery causes the computer to lose track of certain position sensors. As a result, faults associated with the TPMS, traction control, steering angle, and maybe even something else will probably appear. DON’T PANIC! Simply start the car and drive it a few hundred feet. The errors will disappear on their own once the computer detects steering inputs and wheel rotation. The one-touch window opening/closing also needs resetting. To do that, switch on the ignition, close all windows and doors, pull each window-up switch and hold it for at least two seconds, release, then pull up and hold again. Driving the windows into their stops retrains the module, which allows the auto up/down feature to work again. 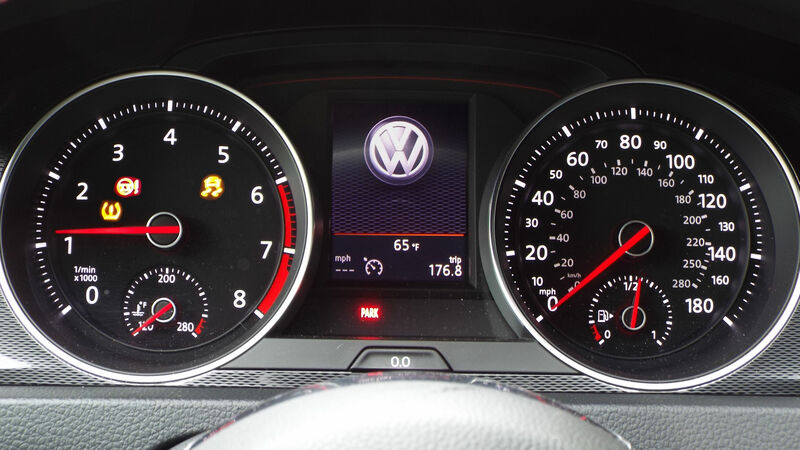 8) Don’t believe VW’s claim that the system is “pre-programmed” for the Golf/GTI. If it is, then it may be pre-programmed for the two-door, file 56, which is no longer available in the U.S. To program the unit, either visit a dealer, rent a dongle, or I’d be happy to flash it for you if you’re willing to meet in Yorktown, VA. Renting the dongle makes programming the system at home very easy (it takes ~30 seconds). In my case, flashing with the dongle seemed to make only a subtle difference. But others have reported dramatic changes. Later, I discovered that the distortion I had at higher volumes was gone after programming. Since the system is marketed as a “Subwoofer/Soundbox,” it’s easy to forget that the Helix upgrade features a 5-channel amplifier with DSP. 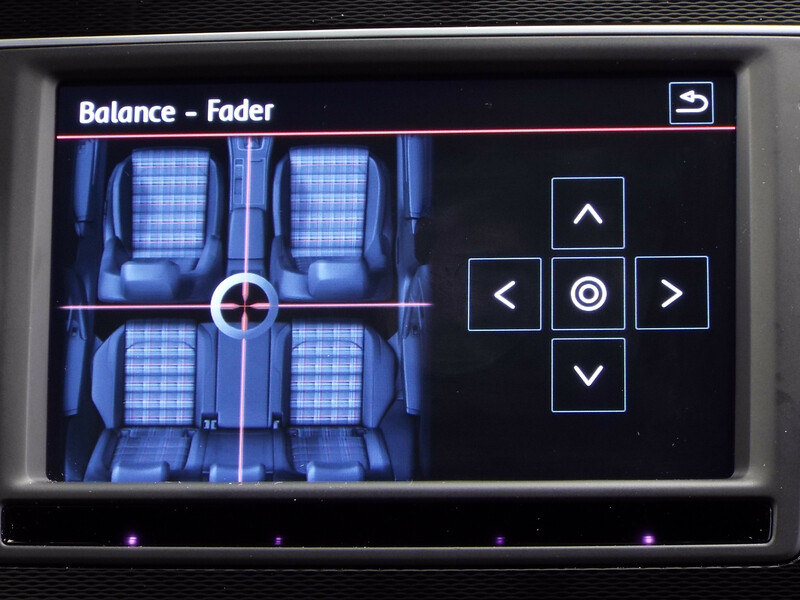 The programming adjusts the mid and high frequencies and focuses the experience on the driver. At “only” 102-dBA, it’s not going to win any sound-offs, but the quality of sound is very good for the price-point. Of course, there’s still room to tailor the tone of the music to suit individual tastes. But the point of Helix is to present an improvement to the stock system, as well as an ideal starting point for upgrades. Overall, I’m very pleased and could even be pretty happy with the system as installed if not for the fact that I had already planned and purchased parts for a subwoofer upgrade. Read more about my upgrade HERE. See more photos below. My impressions of the Helix were renewed when I got my hands on a dealer demo switch that allows me to switch between “Original” and “Helix” sound. Of course, the switch is always in the “Helix” position. But I thought the novelty of hearing the difference from time to time would be cool, even if only briefly. I shared the difference with a coworker. I started with it in the “Original” position. “That actually sounds okay,” he said. Then I switched it to “Helix.” “Oh, WOW! That’s a big difference,” he immediately exclaimed. He became more and more impressed as the song continued and we switched back and forth between the modes. As we exited the car, he finished by saying “I feel like something’s been missing from my life.” 😀 That was funny! NOTE: Some have squeezed their Helix subwoofer in with the donut spare tire by removing the subwoofer’s rubber “feet” and using a longer spare tire retention “bolt,” VW P/N: 1T0-803-899-B. More details HERE. UPDATE: I’ve published a long-term update HERE. Here’s a sub that’s stacked on top of the spare tire. Good write up!! Pretty much sums up this pretty well. Can definetelly agree this fits into a Jetta mk6 with the spare tire as well, and ties down nicely with the longer spare tire nut fastener part. An awesome upgrade if you dont have Fender or a Dynaudio system installed factory. Nice write up. Thanks for sharing this. Having the option of keeping the spare makes this install much more palatable for me. Let me know if you end up wanting to sell the helix, looks like I lost out on the price decrease :(. Thanks for the note! Unfortunately, I won’t ever remove my Helix. I wouldn’t want to deal with the wire loom again (and repinning the harness back to stock). When I sell the car (IF I do before it’s worthless), I’ll remove my electronics panel and then return the Helix enclosure to spare tire well for the next owner. Thanks for the link! I’ll wait it out a bit and see if I can grab one cheaper somehow. I’ll likely end up caving and buying retail. Did you end up using any tools to remove the trim, or just bare hands? Thanks for the responses :). The trim panels came off without tools. Thanks for the information. By the way, I did find someone willing to sell me the wire loom for $50, so if you’re willing to sell the helix without the wire loom, please let me know! Interesting, I’ll have to do some research as I’m not overly knowledgeable on car audio. The helix just seems like such a solid and simple upgrade, I might just have to bite the bullet and buy it at current retail price. I really wish I was looking into this a few months ago! I was speaking to the VW parts manager at our dealership. He said they received the programer with their first order of the sub. He holds onto the programer and loans it out to the service department. Service charges $200CDN to install the amp. Hello sir.. can i ask u some question? 1. From the pin out diagram (subwoofer pin out), it show that the DSP supply 4 speaker of subwoofer (- 4, + 4)…is it true? What i know is PP7E sub box, it’s using two subwoofer wright? 2, Do u have Manual setting using the helix program? Adi – Yes, the amplifier is outputting four speaker pairs for the sub. There are two subwoofers in the Helix subwoofer enclosure, but they are each dual-voicecoil woofers, which means each subwoofer has two sets of inputs. I did not use any “manual” settings for my programming; I simply went with whatever the dongle flashed for a four-door Golf/GTI. Great write up and thanks for all of your hard work. I myself enjoy the addition of the soundbox, but I’m still wanting more. I am planning on using the atx adapter you referenced to wire in a new processor and amps, and I was wondering if the pin out diagram is the same for the PP50DSP and PP62DSP processor? Also, do you know what Masse translates to? Are those ground wires or just pins that are not used? Any information would be greatly appreciated. Thank you Scott! My assumption was the two +12 Volt pins were to power the DSP and Amp and the “Masse” were their grounds. I tried a couple of online translation engines and none of them came back with ground for “Masse”, so thank you again. My local dealership has one of these for quite a good deal, any idea if it would work on a 2012 GTI with Dynaudio? The factory sound is damn good but is missing some of that bass, would love to add a nice hidden sub! Cost and effectiveness are relative. I was very happy with a 125W system in my Mk3 Jetta. But it was mostly a low-volume system that ran out of punch around 50% volume. Hey Scott. Do you know of anyone who can repair the DSP unit, or where I can purchase another one? It’s the AMP.051.419.B. I purchased the Sub knowing it didn’t work with everything new in the box. Apparently some broke the potentiometer and replaced it with new one that has the screw on top. I’ve hooked everything up without running the wire harness, fuse is good, status light is on and all my speakers work but no sound from the sub. I’ve measured resistance on both legs of the pot and the values change when I adjust the trim. Btw the legs of the pot go to the large heat sync transistors on each side. Any ideas? I do have an email into Helix but haven’t heard back. I may play with it some more and if I can’t get it to work I may try to use the sub and harness with a new amp and crossover. If you have any input I’d be grateful. Chuck – If you got a good price on the package, you may find it worthwhile to abandon the amp and switch to something else. The Helix wiring harness alone really improves the options for expansion and feeding all signals right back into the factory speaker wiring. Good Luck! Just installed the Helix sub today in my 2017 GTI Sport. I want to thank you and all the other guys in the links you provided! I couldn’t have done the install myself without all the great videos, lessons learned and helpful suggestions. The system went in without a hitch. One dealer wanted to charge $1000 labor for the install (because they admittedly had never installed one). When I decided to tackle it myself, that same dealer would not sell me the programming dongle, but would happily charge me $162 to do the 30 second programming for me. 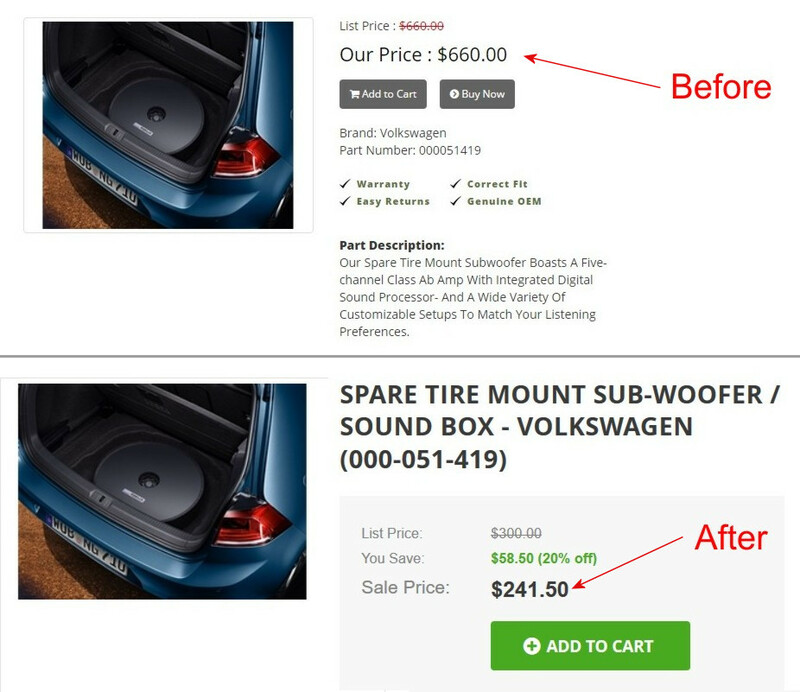 I found another VW dealership who sold the sub and dongle for $539 and $144 (10% off the list prices of $599 and $160 respectively). I’m getting another 15% back through a VW rebate. So, it wasn’t the best deal, but I’m very pleased with the end result. I too used the “57” setting on the dongle, and I agree that the difference after programming was subtle. I didn’t really check high volumes before I did the programming, but there is no distortion like you mentioned. I think it’s a nice upgrade to the stock stereo for the money. Just completed this upgrade today! Found a used dongle on eBay for $75 shipped, so used that to code my Sportwagen to program #60. The sound upgrade is solid. Not the tightest bass, but decent. The DSP does a good job of cutting bass from the speakers, so the stock woofers can function like true mid-bass drivers and can go much louder with more accuracy and less power and without fear of over extending. The mids and highs get slightly shrill at really high volumes, while the bass remains composed. Not sure if this is a limitation of the amp or the car’s stock speakers. The staging is decent. Again, not the best, but there seems to be a virtual stage somewhere above the shifter, at about ear height. I’d prefer it farther forward, above the dash, but all in all for the $475 the system cost me including the dongle (and before a $60 rebate which I’m waiting for), it’s worth it. The first thing I noticed, an old familiar sight, was that my rear view mirror shook on bass notes. Hadn’t observed that since my last amped and subwoofer-ed car in 1991. Thanks for the very nice writeup. It’s always nice to have photos to supplement the official instructions, which I found to be unusable. A note on the Helix wiring harness– it’s a really nice, almost plug-and-play harness, but I was concerned by some other comments made elsewhere on the internet about all the extra wires and terminal blocks behind the head unit getting pinched and preventing the head unit from inserting back into place properly. 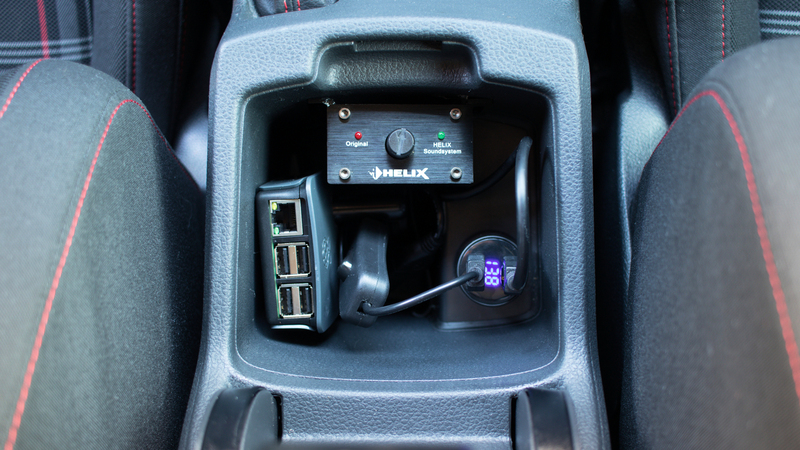 The Helix harness does add a lot of bulk behind the head unit, with all the adapter terminal blocks. To minimize this bulk, I un-taped the first two feet of harness behind the mass of terminal blocks, and separated the wires into their three segments– the headunit speaker out set, the amp speaker out set, and the 12V power set. Then I re-taped them separately with Tessa tape. The speaker out set from the amp is the bulkiest of the three. 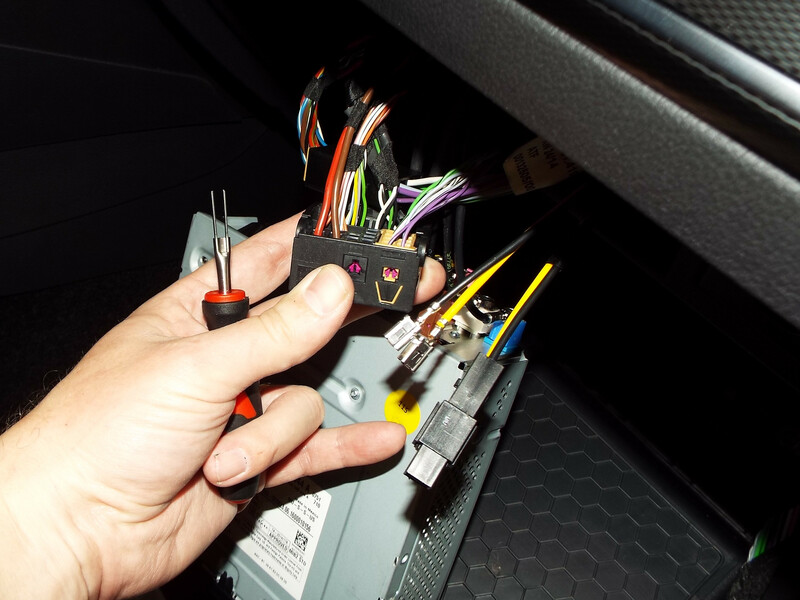 Since this set connects into the car’s speaker wire harness, and not the head unit, it does not need to fit behind the head unit. I was able to reroute that terminal adapter block completely behind the dash, outside of the head unit cavity. This left plenty of space behind the head unit, so it slid right back into position without fuss. Also, I wrapped the Helix harness terminal blocks in Tessa tape to prevent any rattles behind the dash. Anton – Thanks for writing your comprehensive entry! I was very conscious of where I routed my cable, making sure it did not pass through or near metal structures or sharp edges behind dash. I don’t recall the specifics, but I did manage to route my cable in a way that gives me enough room to pull out the unit while still allowing the wire to tuck away. After reading this and especially after watching your youtube video, I installed the Helix system in my brand new GTI today. I wasn’t interested until I heard you explain how it was a system upgrade, not just subwoofers. Everything sounds better and I’m waiting to rent a dongle to get it reprogrammed. I just purchased aftermarket radio for my 15 Golf Sportwagen, I conect it, everything is working except sound, than I figure out, that my plug doesn’t have wires or plug for speakers, how can I find which wires is for speakers? I appreciate your web page. It’s very helpful. We just purchased a 2018 Tiguan SE. The Helix system looks like a great option. If we can find the “original” Helix kit, would it work on our car, or do we need the newer “B” version? I may consider a different sub, but still use the Helix amp. How would I determine which pair / pairs of W1-W8 to use? I’m looking for the harness cable of helix subwoofer. I want to buy a used helix subwoofer from a guy who left his harness at the end of his renting car. What is the model number and where can buy it in Canada or US for golf mk7.5 2018 ? Do you happen to have the dimensions of the subwoofer? I have an e-Golf which didn’t come with the spare because VW used that space for a bigger battery, so their catalog says it won’t fit. But, the fact that you’re able to fit the spare in and close the top cover makes me think it should still fit. Thanks. No worries. The e-Golf still has a false floor in the back, but VW got rid of the space where the spare tire is in order to fit more battery. There’s still about 5-6″ of storage space in the rear. I found an unboxing video of the sub and they measured it and it will fit in the e-Golf. I’m sure though, that because there’s no spare tire tie down that is why VW doesn’t list the Helix as fitting the in the e-Golf, but I’m not worried about it at all. Just had VW Dealer install the Helix sub/amp, ran into a problem w/ hearing siri in maps and the assistant in Waze. Wondering if they crossed some wires or something? Did you have this problem after install? Howdy, Scott! Thanks, very much, for the nudge to get this done to my 3-week-old MK7.5 SE w/DSG. I went ahead and paid (full price) for the local VW dealer to procure and install the Helix sound upgrade: wonderful improvement. Like you, I wasn’t unhappy with the base system, but, the upgrade is immediately worth it — and, I get to have plaid, cloth seats. Thanks, too, for your site — the intentional, stealth tone of your GTI is also my goal. PS: sound is excellent and we didn’t have a dongle — wondering if the newer Helix amps perhaps already flashed/programmed for this iteration of 4-door GTI? Hi Scott. I want to upgrade my 2018 GTI SE with the Helix system, but I can’t decide whether I should get 5G0-035-621 for $250 or 000-051-419-B for $500. On one hand, I don’t think new version is 50% better compared to the old one to justify 50% price increase. On the other hand, I am planning on keeping my GTI for 5-7 years so I would invest extra $250 in the newer version if the sound is noticeably better. Thanks for your help! Also, 5G0-035-621 is not a Helix part. I think it may be Fender. I updated my original response to reflect that. Thanks for your prompt reply, Scott. I should have noticed that myself… Thank you! My 2018 GTI SE came prewired head unit to trunk so no need to run the cable… hope this saves some folks a bit of time. Hey Scott! I just finished plugging the existing prewired cable up and the system works perfectly. Sub is firing and sound is greatly improved. Compared both cables and they are identical, which makes me think that with the “B” revision of the Helix they normalized the cable and connections between the Helix and Fender parts. I’m not sure I understand. You found a four-wire plug in your trunk and plugged in a Helix sub to it? No I found a 20 wire and plugged my Helix into it. I confirmed that the cable running from my head unit area to the trunk was identical to the cable that came with the helix aftermarket system. As a result I did not need to rerun any cabling. The only thing I had to do was the splicing work up behind the head unit. Maybe check under the passenger trim to be sure… it’s also not impossible that the previous owner of my car had the Helix and removed it. I’m not a GTI owner, but I’m very interested in what I’ve read here about the Helix retrofit. I just bought a 2019 VW Atlas with the factory installed Discover Media Infotainment System, MIB2 w/Navigation. The system is good, but could be better if it had a subwoofer. Does anyone know if the Helix system, with proper tuning, would work as an alternative for the Non-Fender systems in the Atlas SEL trim line The SEL line (non-Fender) are equipped with the MIB2 w/Nav in the glove box and do not have a separate amplifier under the driver’s seat like the Premium-Fender line. I believe the factory MIB2 head unit has 4 channels, 1 channel to each of the four doors, these channels are split within the door between a woofer and tweeter, thus 8 speakers total. 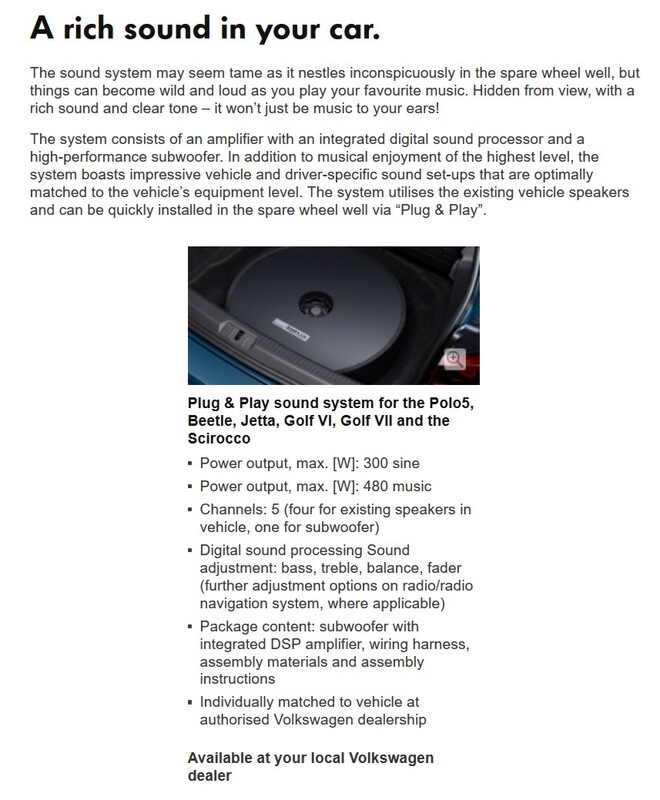 I wondered if the Helix subwoofer system would also be Plug and Play in the Atlas, with the proper tuning, but I just can’t seem to confirm its compatibility with the head unit. Thank you Scott. The programming does seem to be the main problem. I’ve contact MSC America (the U.S. distributor for Audiotec Fischer) and their Director of Technical Support has agreed to asked Audiotec Fischer about developing a programming solution for the Atlas – assuming the Discover Media system (MIB2 w/Nav, VW Part # 3QF-035-880-A) is otherwise compatible, which is what I’m really trying to determine at this point. 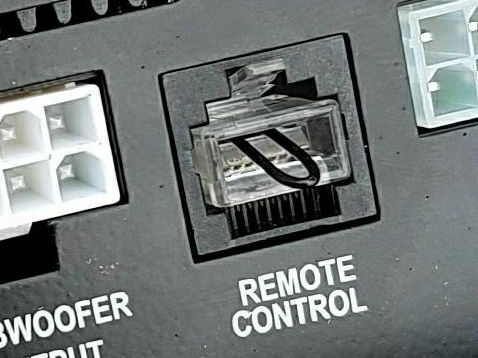 I know the Composition Media system (MIB2 w/o Nav, VW Part # 3Q0-035-878-B) is Plug and Play, but I’m just not sure about the wiring compatibility on the MIB2 w/Nav – if it turns out the wiring fit is the same, then it would seem that correct programming is the only obstacle. 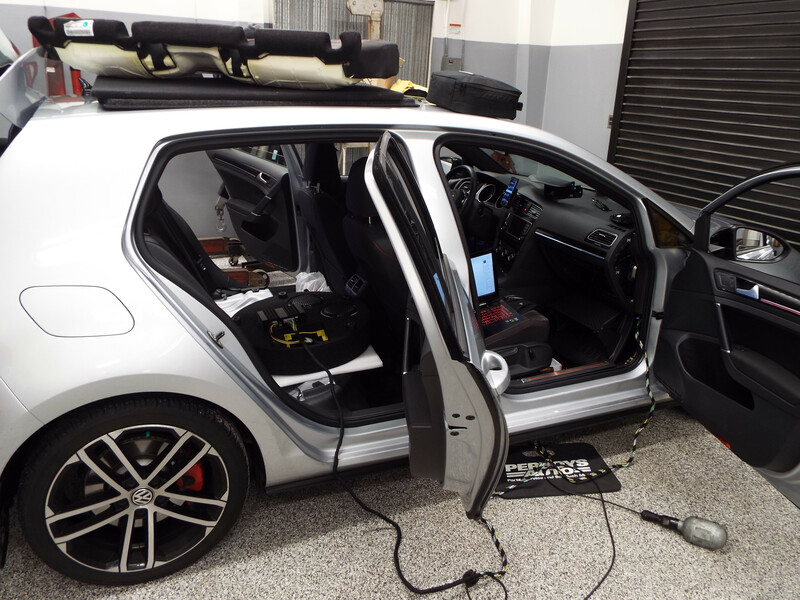 I recently had my Helix subwoofer fitted in the spare wheel housing of my R line Tiguan, using the dongle purchased alongside to set it up for the Tiguan and to be fair it sounds mighty impressive. There is one small issue that has arisen and I wondered if you could help me with it. The Tiguan comes with the Discovery head unit which runs the sat nav, parking sensors, audio etc from the main unit and before the sub was added, when the sat nav announced directions, the sound from either the iPod, cd or radio would turn down but since the Helix sub has been added, only part of the music is decreased. Do you know why this is and is there something I can do to change it ??!! I have recently had the Helix fitted to my 2017 Golf GTD. It already sounds better but that might be because of the increased power from the Helix amp. It sounds to me like the system is now over driving the existing speakers. Does the programming reduce the amount of low end bass going to the existing speakers and redirect them to the sub? Do you get a new option on the sound menu of the MIB that allows you to set the level of the sub woofer?